Sciblogs | Murky waters: why is Japan still whaling in the Southern Ocean? Photographs allegedly showing Japanese whaling operations in the Southern Ocean emerged this week. Coinciding with Japanese Prime Minister Shinzo Abe’s visit to Australia, critics have called for greater action from the Australian government on the issue. Japan has stated that, despite various resolutions at the International Whaling Commission and criticism from many governments about its so-called “scientific” activity, it abides by its own interpretation of the Whaling Convention – the international agreement that governs whaling. This interpretation focuses on Article VIII of the convention, which allows a country to issue its own permits to kill whales for research. The same issues are raised each summer when Japanese whaling fleets head south. But the apparently obvious questions have complex answers. Didn’t the International Court of Justice ban Japanese whaling in the Southern Ocean? The 2014 International Court of Justice (ICJ) whaling decision was quite narrow. It ruled that the old JARPA II scientific program was not for the purposes of scientific research. Therefore, the court deemed that Japanese whaling was a commercial operation, something that had been banned under the Whaling Convention since 1985. Labor’s former attorney-general, Mark Dreyfus, noted that the court had not completely ordered cessation of whaling for all time. And this is correct. While the judgment gave guidance on what is and what isn’t “for the purposes of scientific research”, it did not ban Japan from conducting further scientific research activity under the convention. In response to the judgment, the Japanese government abandoned the JARPA II program. The current and very similar NEWREP-A program took its place. This program, in all likelihood, is “not for the purposes of scientific research” either. 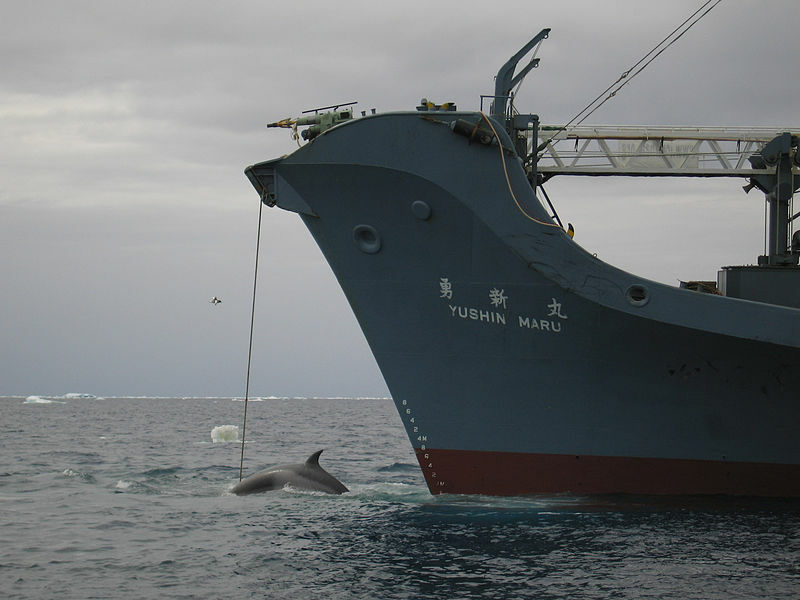 A whale is captured by the Yushin Maru, a Japanese harpoon vessel, in 2008. Credit: Australian Customs and Border Protection Service. Should Australia take Japan back to court? Following the ICJ case, Japan ruled out the jurisdiction of the ICJ in “any dispute arising out of, concerning, or relating to research on, or conservation, management or exploitation of, living resources of the sea”. Therefore, Australia could not take Japan back to the ICJ on this issue. Is the whaling fleet operating in Australian waters? The waters below 60 degrees south fall under the Antarctic Treaty, to which Australia and Japan are both parties. The treaty was a peaceful territorial compromise between countries (like Australia) that claim parts of the Antarctic continent, and other countries (like Japan) that do not recognise those claims. Australia claims about 5.9 million square kilometres of the Antarctic continent, and the adjacent ocean out to 200 nautical miles. However, the treaty “freezes” any arguments over the sovereign claims by Australia, New Zealand, France, UK, Chile, Argentina and Norway, and has developed a complex web of instruments that protect the Antarctic environment and maintain the continent as a place of peace and science. While Australia does not relinquish its claim to Antarctica under the treaty, it agrees to comply fully with the treaty’s rules and obligations. In turn, this means countries that don’t recognise claims are free to go about scientific research and peaceful activities. Japan does not recognise Australia’s claim to the Antarctic continent. As such, it views the waters off the Australian Antarctic Territory as the high seas, which are governed by the United Nations Convention on the Law of the Sea. The Antarctic Treaty’s Environment Protocol also explicitly states that it does not affect the rights of countries under the Whaling Convention. In almost all cases, only Australian citizens are bound by Australian law in Antarctica. If there are any issues of jurisdiction under the provisions of the treaty, countries must resolve them peacefully, or refer them to the ICJ. Didn’t the Australian Federal Court say whaling is illegal? In 2008, the Humane Society International took Japanese whaling company Kyodo Senpaku Kaisha to court over whaling in Australia’s Antarctic waters, which Australia calls the Australian Whale Sanctuary. The Federal Court held that whaling in Australia’s maritime claim was illegal under Australia’s Environment Protection and Biodiversity (EPBC) Act. It’s not up to the Federal Court to question Australia’s claim to Antarctic waters, so it applied Australian law in a consistent manner. The EPBC Act is also one of the few that extends to non-Australian citizens in Australian-claimed waters in Antarctica. But remember that Japan does not recognise Australia’s claim to Antarctic waters. Even though the Federal Court recognised this, it held that this was not a reason to withold judgment. In 2015, Kyodo Senpaku Kaisha was held in contempt of court orders by continuing to kill whales, and was fined A$1 million. The Japanese government responded to the case, stating that “this issue relates to waters and a matter over which Japan does not recognise Australian jurisdiction”. Therefore, the restraining orders and injunction on further whaling are still outstanding and will likely remain so. Should we send Australian ships to confront the whalers? The Australian and Japanese governments are under an obligation to prevent Antarctica becoming a place of discord. Any confrontation on the high seas would be seen as an incredibly aggressive and potentially illegal act. The Australian vessel Oceanic Viking was sent to monitor the fleet in 2008 to compile evidence for the ICJ case. It did not intervene physically with the whaling fleet, likely due to its potential illegality, aggressiveness, concern for the safety of lives at sea, and environmental reasons. Japan is transparent about its catches and reports all its activities (including the number of whales it kills) to the Whaling Commission as part of its self-issued scientific whaling permit. Countries that are members of the commission therefore have access to all the information on Japanese activities. The Greens are calling for the Australian Border Force to be sent to Australia’s Antarctic waters, but, for the reasons above, this is likely to be futile. Australia appears to have exhausted most legal options. Professor Tim Stephens noted, however, that the International Tribunal on the Law of the Sea could be a forum where Japan is challenged over its activities. Obligations under the Law of the Sea Convention include mandatory dispute resolution, the protection and preservation of the marine environment, and duties to cooperate. Several alternative courses of action have been suggested and new resolutions at the Whaling Commission have yet to be implemented. However, the decision to stop Japanese whaling is, in reality, likely to come only from the Japanese people themselves.